Any comments of my trusty raised-chainstay KiliPro. Bought new in 1992 and has been used since then - even so it's suprisingly original... it's worked so well, especially uphills, that I've really had the need to upgrade anything. Saracen made some great looking bikes that year.Was this the same year they did an aqua green model? Think it had a full campagnolo Record O.R grouppo and Campag rims. Looked ace! 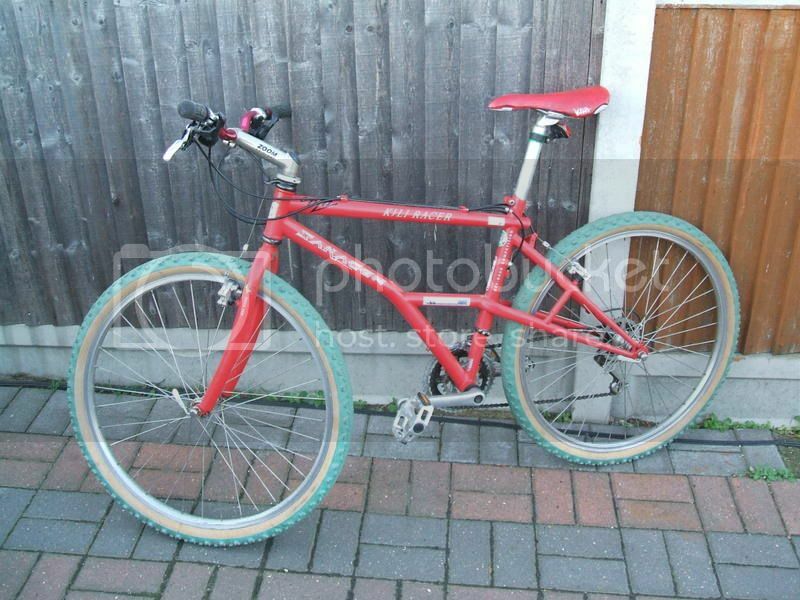 I know Saracen did a 'standard' Kili (still raised-chainstays) in red that year... that was the model that I'd budgetted for, but the bike shop made a mistake and quoted me and a mate the standard price on the 'Pro', so I ended up with the bike you see. I was actually after a previous model year Cinder Cone, but that week no-one wanted to discount them... two weeks later though and Evans had dropped their price. In hindsight, I think the Saracen has proven to be a better bike. The Magura hydraulic brakes have never needed servicing (apart from new blocks). The only problems have been the original Ritchey rim which kept going out of shape, so was replaced, the saddle wore worn-out and one of the original pedals broke... hence the SPDs, but I've still got the original pedal clips and straps. And much of the exposed paintwork was covered in insulation tape to protect from some of the normal MTB abuse. Even the Crud guard an early 'square'model... and there's an old whale-tail hidden somewhere in the garage. Oooh, I'm still addicted to e-stays! First dibs if you decide to sell or swap...! Like saracens , like estays, dont have any but I also like maguras. think I like your bike. I reckon the Ultimate is a bit of a doorman bruiser of a bike - it weighs a ton! God knows what old iron they made them out of... but hey, its an e-stay, so all's cool here! That would be one of these then. Picture taken on my drive at the weekend. I've owned the bike from about a year old, belonged to my brother from new. What do we reckon was/is the lightest e-stay ever made?